This Limited Edition is the start to a collectable series, and its bold slipcase makes it a great coffee table book. The large 12″ x 14″ book and its slipcase come in Simon’s preferred soft touch / metallic foil lettering finish, with a unique cover art. Three languages inside: English, French, and German. Start your collection now. The ‘Pitlane Club’ is a highly personalized and hand-finished series, each approved by Daniel Simon. The heavy slipcase comes with an aluminum plate with your name and book number stamped. 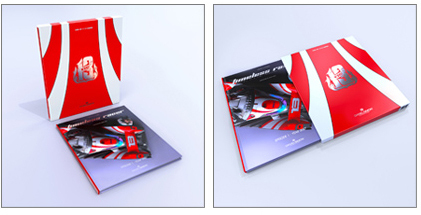 The book is printed on heavy photo paper and includes a fifth silver print color, a 12″ x 14″ poster, and an introduction by the head of Ferrari Design. Each book is signed, hand numbered, and dedicated inside. Protected in a custom shipping box. The collectible cloth bound edition of DRIVE in a cloth slipcase, limited to 250 signed and numbered copies worldwide, will each be personalized with a sketch. The Drawthrough Limited Edition is an exclusive, two-volume limited edition set of both Start Your Engines and Lift Off from Design Studio Press. Richly bound in velvet-smooth blue-charcoal latex with metallic foil lettering and a high-gloss cover picture. Comes in a deluxe slipcase, also with metallic foil lettering. Only 108 sets available worldwide! The Drawthrough Limited Edition includes two regular hardcovers presented in their own deluxe slipcase with glossy air vehicle sketches and glossy orange lettering. A Design Studio Press exclusive! Own the most comprehensive collection of concept art vehicles by world-renowned designer, Scott Robertson, today! The Concept Design 2 Limited Edition is handsomely bound in velvet-smooth white latex, embossed with metallic foil, numbered and signed by all 24 artists. Limited to 200 copies, this edition will not be reprinted or available elsewhere. Signed by all 24 artists!